Gilbert Litigation Lawyers & Appellate Attorneys at Denton Peterson, P.C. Disputes will arise over the course of operating your business, even if you provide the best products and the best services. A customer or a contractor may be unhappy about a product or service you provided, or you may have your own complaints about a supplier. Business partners can clash over profit sharing, control of the business and other issues. When it does become necessary to resolve a dispute, working with an experienced Gilbert litigation lawyer can help you get the outcome you desire. The attorneys at Denton Peterson PC have decades of combined experience litigating business, corporate and other civil disputes, and they are ready to put that experience to work for you. Our litigation lawyers are ready to take on any legal dispute you might have, whether you are the one bringing the suit or you are trying to defend yourself. Litigation is never simple. If the issue was clear cut, there would be no need for the case to go to court. It is essential that your litigation lawyer thoroughly review your case to find all the pertinent points of law and to determine the right strategy for success. At Denton Peterson, we take our time to really get to know you and the case before we dive in. We don’t use a cookie-cutter approach to lawsuits, and that’s why we have a track record of success. We spend time getting to know all the circumstances that led to the suit and to understand your perspective. How Do I Know If I Have a Binding Contract? Only when we have all of the information, do we determine the right strategy for litigating or defending your suit. We take into account the goals you have for the case, as well as your budget. It may be that a simple negotiation is enough to meet your goals for the suit, or it may be that we need to take the case to court. Our attorneys also counsel clients on when it is best not to pursue litigation or aggressively defend against it. We let our clients know when there is not a realistic chance of winning the suit and when they should consider mediation or negotiating a settlement instead. We want to make sure our clients obtain the best resolution possible, whatever their circumstances. No attorney-client relationship can be successful without good communication, nor can any litigation. Our Mesa litigation attorneys are committed to building a relationship with our clients, and that includes responding quickly to calls and emails and listening attentively during meetings and discussions. Our attorneys answer all your questions thoroughly and patiently, and they treat you like an active partner in your case. We also promise that our attorneys will be prepared for every meeting, phone call, deposition, court date and other events in your litigation case. Our attorneys show up informed and ready to deliver the best argument or handle the best negotiation. When you hire the Gilbert litigation lawyers at Denton Peterson, you can feel confident knowing that you are hiring the best. Our firm has an established reputation in Gilbert and the entire East Valley, thanks to our exceptional service and our record of getting results. Contact us today to discuss your pending litigation and learn how we can help you. 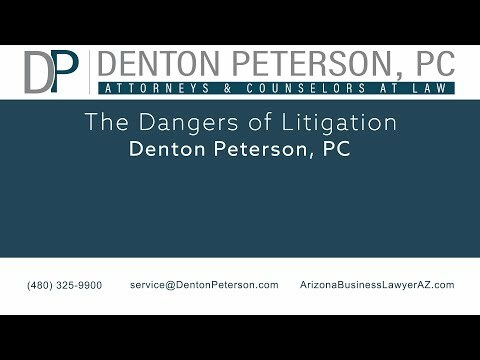 The Dangers of Litigation | Denton Peterson, P.C.